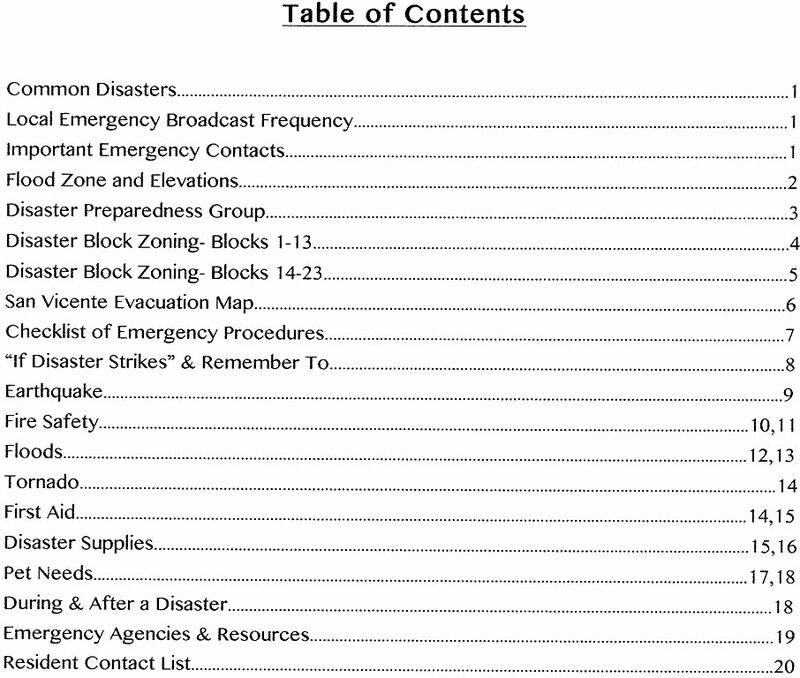 I appreciate the support of the SV office for our 11/19 meeting, and they have kindly provided me a copy of their “Emergency Preparedness & Evacuation Plan” containing much of the information here in the DPG “911” section of this website. Their plan may be available from the office in print or via email. For your reference, below is the Table Of Contents page of that document. In case the predicted El Niño floods affect SB this Winter, I was curious if and how we might be affected here at SVMHP. I found an insurance “100 year” flood risk map at this FEMA link and have downsized & cropped it for an easier to manage map of our area. The blue outlined area affects mostly lower Rancho Santa Barbara homes but several of ours are included. 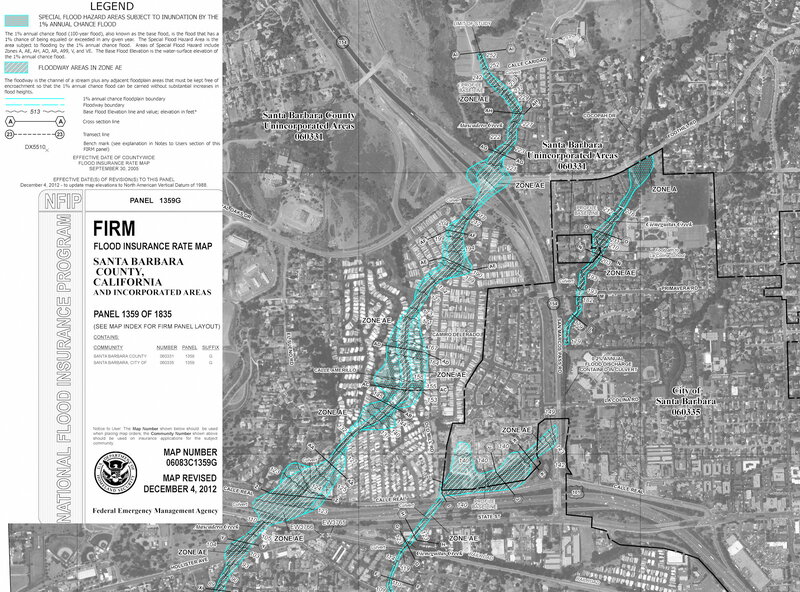 I note that this map represents flood risk if the channel is kept clear of debris, and since most of the creeks and channels are on private land, government agencies would not do that during a major regional flooding event. Here’s my downsized and edited version of the FEMA flood risk map (click on it to enlarge), with the Legend cropped to relevant items and moved to the left side. There’s a different version of this map that’s interactive and in color at this FEMA Flood Hazard link. Here’s a zoomed in and cropped area of that map (actually a satellite view) of our affected homes along the green belt. More would probably be affected if there were any debris blockage of the bridges or other factors in an unprecedented exceptional flood. There’s a description of terminology and more info at this FEMA Community info link. You can find more local info and links on the County Flood Prep link and their new site. Although there is no history of damaging floods at San Vicente, in an exceptional rain event access to the Cathedral Oaks exit could be blocked. Our bridges over the Atascadero Creek barranca running through San Vicente are unlikely to be blocked by debris. There is some possibility that the culverts under Cathedral Oaks at the base of Hwy.154 or Via Chaparral could block and flood the Hwy.192/154 intersection. 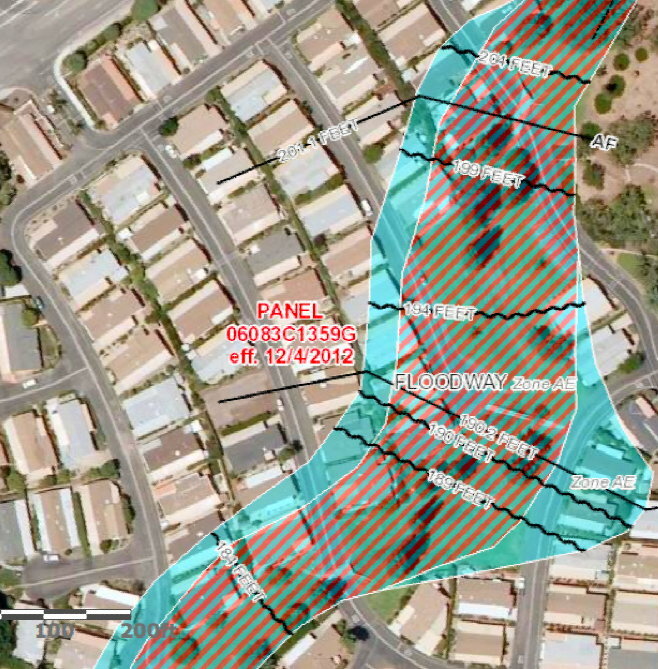 That wouldn’t affect San Vicente unless Cathedral Oaks then filled up and spilled over the wall or through the upper gate, in which case it would probably run down our streets into the barranca and/or through the lower Old Mill gate. Here are some aerial views of the terrain above San Vicente (click to enlarge). 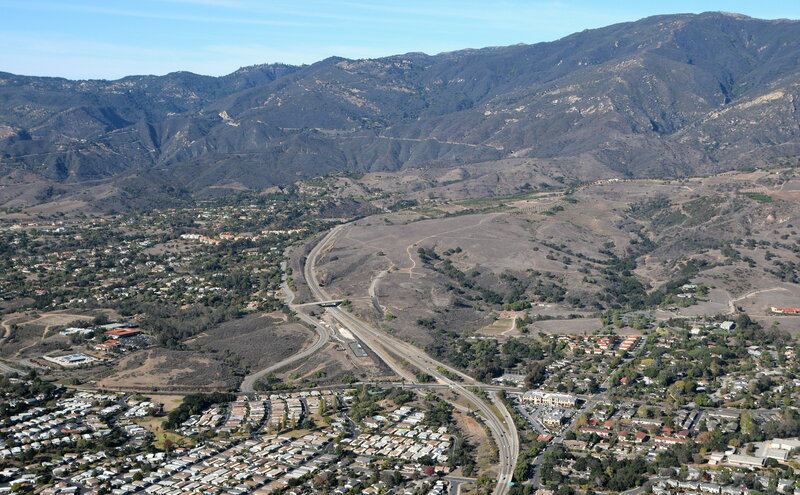 The basic watershed drainage area above San Vicente extends from this side of San Antonio Creek angling toward the Northeast across to the first ridge across the above pic, and East to a ridge running South on this side of Cieneguitas Creek (beyond the right side of this pic). A small section of that creek is marked by the line of trees running across the bottom-right corner of the above pic. Just before sunset, shadows help to reveal the terrain contours as seen in the above pic. The ridge across the top where 154 disappears from view is the top of our watershed, extending just beyond the top-right corner. 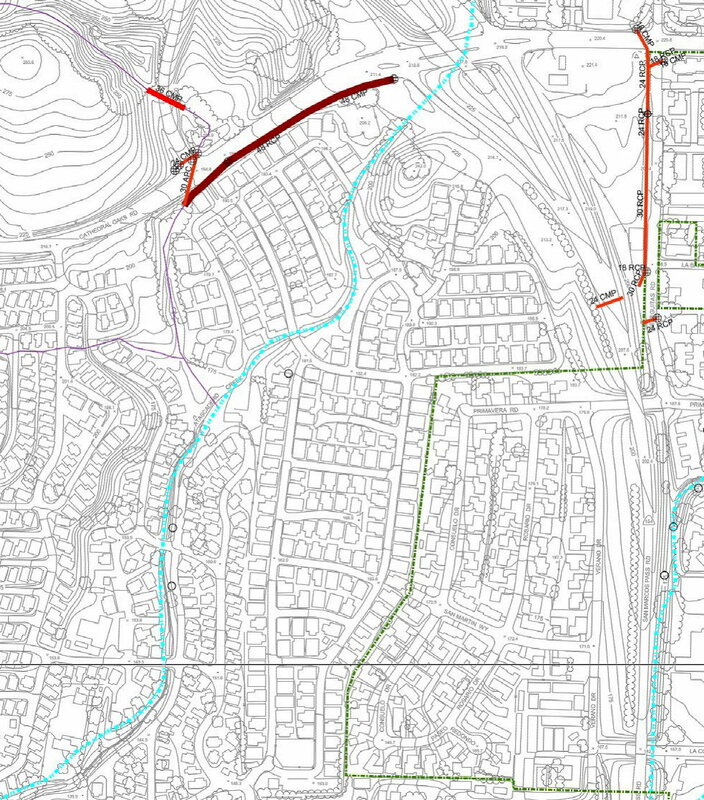 I found a website for County storm drain maps and have stitched together maps G36, G27, G18 and G9 to cover Atascadero Creek from 101 to the top of their maps. Here then is the area immediately around SVMHP (click to enlarge). Here is a full-size version of this composite map (click to enlarge) with more of the surrounding area included to show nearly all of the watershed above San Vicente. 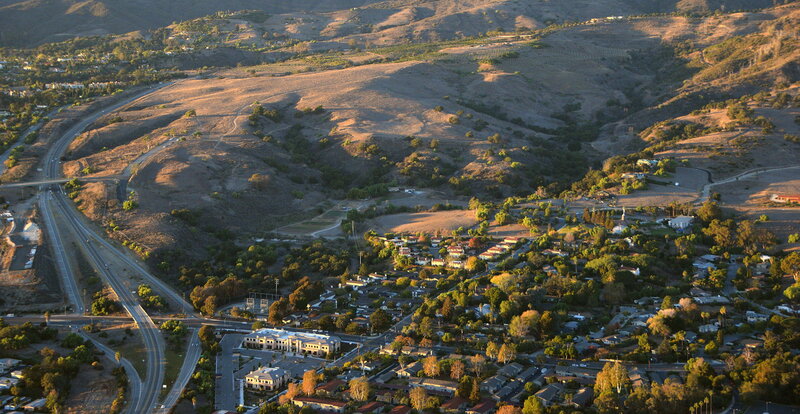 The two main sources of runoff are to the Northwest (NW) above Via Chaparral, and to the North along Atascadero Creek.